AGC Publications - Applied Geography Conferences, Inc.
Journals The AGC has had two distinctive series of peer-reviewed research outlets. From 1978 to 2014, AGC published an annual proceedings consisting of selected research articles presented at the conference. From 2015 to the present, AGC has entered into an agreement with Taylor & Francis to establish a new, peer-reviewed journal that is published multiple times per year. Books Past AGC conference papers have also been collected in a series of edited volumes. The AGC has supported the publication of three such volumes to date. Please see our AGC Books page for more information on these volumes. 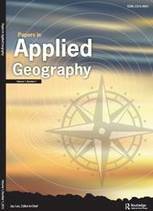 Papers in Applied Geography is the official journal of the Applied Geography Conferences, Inc. The journal encourages and supports high quality scholarship on a broad range of applied topics across the discipline of Geography. Paper submissions for publication review are accepted year-round. Papers of the Applied Geography Conferences was the AGC's peer-reviewed annual proceedings publication, published from 1978 to 2013. The archive below includes links to every paper in each annual publication from the entire series. ​An edited book series collects past AGC papers in selected theme areas and combines in a format suitable for classroom reference and individual study. The page linked below hosts information on all of these volumes and how each may be obtained.